Now all the Christmas presents have been opened I can share what I made for my family this year. The last few years I’ve made a variety of goat’s milk soaps and bath milk. This year I wanted to do something different but still use goat’s milk. 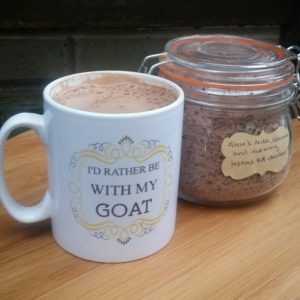 After a bit of research I decided to make my own instant hot chocolate mix using dried goat’s milk. I spent a day perfecting recipes ( and drinking a lot of hot chocolate) finally settling on four flavours Cinnamon and Nutmeg, Espresso, Chilli and Salted Caramel. To make up a mug of hot chocolate you just need to add hot water to two spoonfuls of the mix and stir. Hot chocolate drink mixes are basically cocoa powder, sugar and dried milk with any flavourings you want to add. You can leave out the dried milk if you prefer to make hot chocolate with warmed normal milk. This is my basic recipe. I ended up using cup measurements rather than doing it by weight because it was easier to make changes to the mix that way when I was experimenting. To make the mix you will need a food blender /mixer. Put the chocolate drops in first and blend until the drops are turned into a powder. Add all the other ingredients and blend some more. Put your mix into sterilised jars. 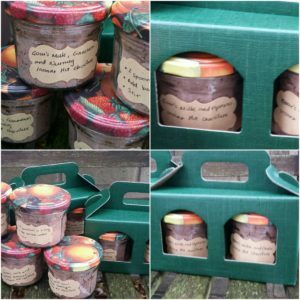 You can add any ingredients you want to that basic mix and play around with quantities to create your own perfect variations. Here are the variations I made. Basic Recipe plus 2 dehydrated jalapeño chillies. Add the chillies to the blender after the chocolate drops or powder them with a pestle and mortar before adding. I used homegrown chillies that I dried in my dehydrator. Personally I could have tolerated more chillies but I have a very high tolerance for chillies and I know not everyone does so I went for a milder flavour. I used Percol Black & Beyond Espresso coffee which I found on Amazon. The Espresso powder can just be added with the other ingredients when blending. This is my favourite mix. It’s very Christmassy. 21/2 cups of granulated sugar and 3 tablespoons pure vanilla extract to make caramel which is added to the mix. For this recipe you will need to make the caramel, let it cool and then smash it up before putting it into the blender piece by piece so it can be powdered before adding the rest of the ingredients. Heat the granulated sugar in a large heavy pan, over medium heat, without stirring. When the sugar begins to melt, swirl it to melt without burning. the sugar will eventually melt to a deep amber color. Remove the pan from the heat and carefully add the vanilla. Whisk the caramel until smooth again. Pour the caramel onto the lined baking tray. Allow it to spread without touching it. Set aside and let the caramel harden, at least 1 hour. I bought my dried goat’s milk from Goat Nutrition Ltd you could use any dried milk it doesn’t have to be goat’s milk. And I made some extra for us to enjoy at Hooters Hall. This entry was posted on Friday, December 29th, 2017 at 1:20 pm and is filed under Blog. You can follow any responses to this entry through the RSS 2.0 feed. Both comments and pings are currently closed.